Already 14,000 U.S. Deaths From Fukushima? International Journal of Health Services alleges that 14,000 people have already died in the United States due to Fukushima. An estimated 14,000 excess deaths in the United States are linked to the radioactive fallout from the disaster at the Fukushima nuclear reactors in Japan, according to a major new article in the December 2011 edition of the International Journal of Health Services. This is the first peer-reviewed study published in a medical journal documenting the health hazards of Fukushima. 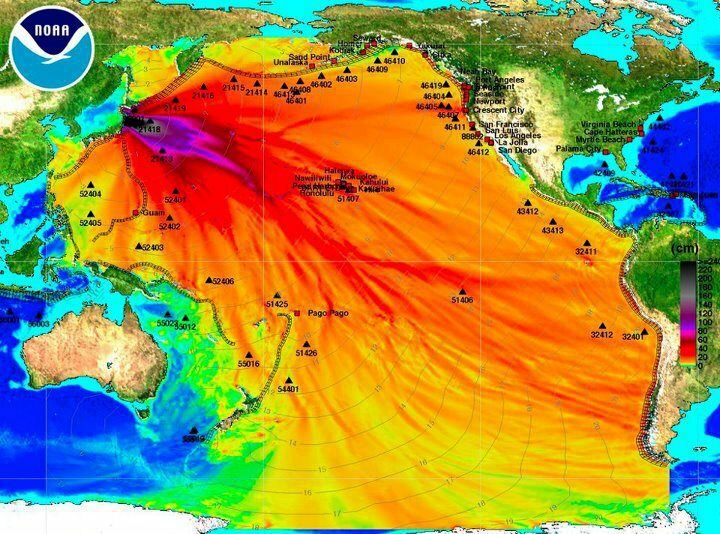 [The authors] note that their estimate of 14,000 excess U.S. deaths in the 14 weeks after the Fukushima meltdowns is comparable to the 16,500 excess deaths in the 17 weeks after the Chernobyl meltdown in 1986. The rise in reported deaths after Fukushima was largest among U.S. infants under age one. The 2010-2011 increase for infant deaths in the spring was 1.8 percent, compared to a decrease of 8.37 percent in the preceding 14 weeks. This entry was posted on July 4, 2013 at 1:04 pm and is filed under 2013 with tags Chernobyl disaster, contamination usa nuclear fukushima, Fukushima, fukushima contamination worldwide, Fukushima Daiichi nuclear disaster, japan nuclear industry, nuclear disaster, Nuclear Fallout, Study: Fukushima Radiation Has Already Killed 14, Tepco contamination world, Tokyo Electric Power Company, United States, West Coast of the United States. You can follow any responses to this entry through the RSS 2.0 feed. You can leave a response, or trackback from your own site. Reblogged this on SOS JUSTICE AGAINST INJUSTICE. I think this is slightly extreme…. I think some cases are coincidences. I mean you would want to know the numbers prior to the meltdown. And people die every single day, and they can still have been in contact with radioactive materials; such as people who frequently have x-rays. Although I believe it is affecting the people of US, I think it is affect people on the Southern-West coast due to the gyre in the Pacific Ocean, pushing contaminated waters over to the US. I don’t see how it may be affect people in Miami, Florida or any of the states in the eastern coastlines. I personally live in Hong Kong and our top university, HKU, which was also ranked 24th worldwide, has stated that radiation has not affected our city. And I’m pretty sure Hong Kong is closer to Japan than Florida is. But I mean I’m not saying it’s bad to be cautious. But I feel that the information is not very reliable. Although your geography is correct, there are a couple things to consider. First off, the entire west coast of the US is affected. Our fish is mostly caught in the Pacific Ocean, and quite a lot of people live there. Second, our government does not like to inform us of important issues that might damage the overall health of their citizens. It’s a thing with us, unfortunately. Thirdly, if the citizens do speak their minds about a very pressing issue, such as a nuclear fallout reaching the masses mouths, they are labeled as one who believes in conspiracies, and pretty much everyone ignores them. So, if anyone, besides the government themselves, try to tell the masses that they are in danger of digesting radioactive materials, they are generally ignored. And, you know, ignorance is bliss … or death. The NOAA picture at the top is a measure of wave height after a Tsunami not a measure of radiation. Misleading information is not helpful. 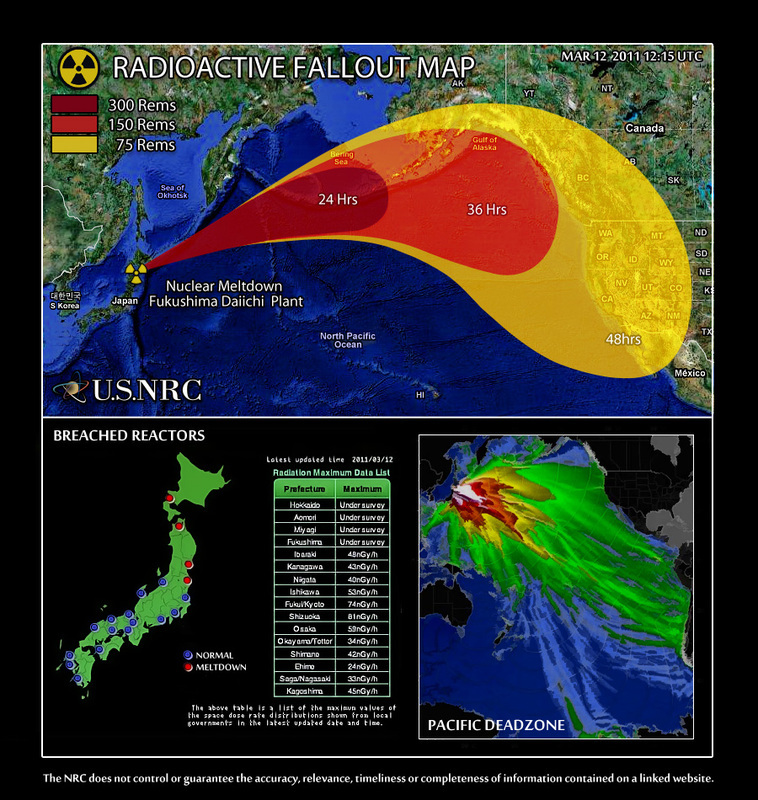 The second image is the radiation map. If you feel misled maybe you could look up another website. This is Your Land, This Is My Land, Let’s make a stand and shout out to protect what was made for you and me.